Unlike some travellers website where people can write anything without any recourse or feedback from the operator, our testimonials are genuine. Should you wish to contact any previous guests please let us know and we would be willing to pass on their phone contacts. "Everything was amazing thanks, had a wonderful time & really surfed well." "Loved our time at Papatura, thank you Margie, Peter and Bobby for making us feel so welcome, also the staff at Go Tours travel. Awesome! Cant wait to go back." My family and I recently returned from a fabulous 10 day holiday at Papatura Island Retreat. Travelling with our 6 and 9 year old daughters is something that my husband and I have waited to do until now, because we wanted to enjoy our time away, and we wanted them to enjoy it too. For those parents out there, travelling with a family comes with many considering factors. For us, The Solomon Islands ticked all of our boxes. Our children had such a ball being able to experience a 3 hour plane ride, taxi, small plane, then boat ride all in one day! What an adventure! We left our home on the Gold Coast that morning, and by the afternoon we were swimming in the warm, crystal clear waters in what can only be described as paradise! Our hosts Marg and Pete were so welcoming and made us feel at home instantly. They have grandchildren themselves, so understand what holidaying with children is all about. They were able to cater for the kids food choices, as well as our own. The girls absolutely loved hearing the lunch and dinner bell ring and excitedly running down to see what was in store for them with each meal. On the tropical rainy days we enjoyed many card games and lots of reading from the books in the Retreat’s library. On the sunny days we enjoyed the walk to the water fall, squid fishing on the jetty, trekking over to dolphin cove, snorkeling at the blue lagoon and out the front of the resort, dolphin boat rides, jumping off the jetty, watching daddy surf, lots of swimming and MANY hours of fishing! For all of us I would have to say that our visit to the local village was a highlight. Meeting the Solomon Island people and seeing how they live was eye opening and extremely enjoyable. They welcomed us with open arms and we will always remember this very special day. We were also lucky enough to visit ‘Honeymoon Island’ and enjoy being marooned in tropical paradise for the afternoon! · Pack some activity books, drawing, colouring-in and books to read for the plane as well as for rainy days on the island. · Bring along snacks for in between meals for the family to enjoy. We found our kids got super hungry in between meals due to all the physical activities, swimming and sun. · Take along beach towels that are thin and easy to dry. Due to additional moisture in this tropical environment, it can take a lot longer for towels and clothing to dry out. · The retreat has a clothes washing service, and this was great to use about half way through our stay to enjoy fresh clean clothes – especially our flying home outfits. We enjoyed island life so much and we will definitely be returning to this beautiful getaway. Just want to thank you and the girls at Go Tours Travel for organizing my recent trip to Papatura Surf Retreat. Being a keen surfer and professional surf photographer, for me it really was 8 days in paradise. Brad and I surfed volumes of waves on crystal clear reef breaks every day to the point of exhaustion, you can’t ask for more than that. Bobby was great, he had us out in the boat looking for waves soon after arrival, He showed us all the breaks and we capped the day off with plenty of super glassy lefts at Zollies and even had a black tipped reef shark cruise past. All the Staff at Papatura were really wonderful to us. Your Dad was back in Australia so unfortunately didn’t get to meet him but your Mom was there and was the perfect retreat host. She created a warm relaxed atmosphere, ensuring we felt most welcome and cared for. Bobby made sure we were having a great time, whether it be Surfing, Fishing, Snorkeling, Site seeing or Drinking and Partying and Josh prepared mouth watering dishes daily for lunch and dinner utilizing fresh local produce. The local girls helping out in the kitchen and dining area were very sweet and all the boatmen are a great bunch and always smiling and happy to run us out to any of the great reef breaks. We had some great nights hanging at the Bar, swapping stories over drinks with other guests and Margie, Bobby and Josh and at day’s end crawled into bed and had a comfortable rest and wake early ready for another action packed day. Travelling to the Solomon Islands had always been on the to do list, it just looked like an absolute tropical paradise in the pictures we saw. We didn’t really know what to expect as there isn’t a whole lot of information out there. All we knew is that it was beautiful as well as full of history and culture. Perfect! 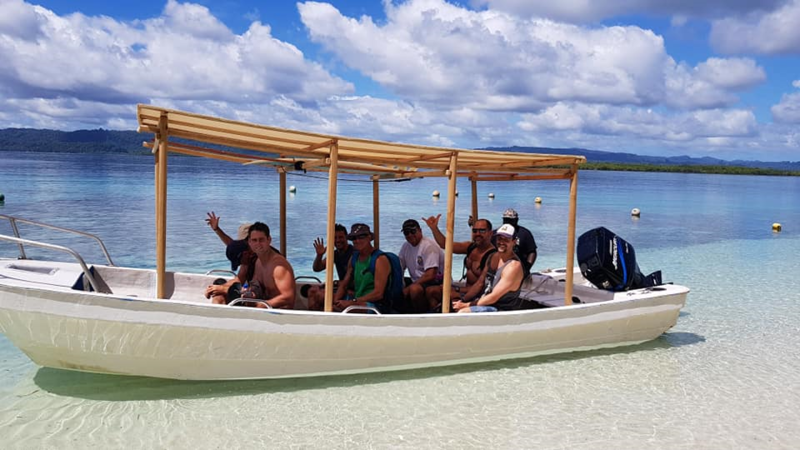 Travelling to Papatura was a real adventure, from the 18 seater plane to landing on a grass airstrip and being ferried over to the island by boat. From the moment we caught a glimpse of Papatura, the excitement was uncontainable. It looked so wild and untouched. We had undoubtedly stepped off the map! Exactly the places we love to visit. We were instantly greeted by Pete, Marg and the two friendly dogs with a very warm welcome. What accommodating hosts, full of endless stories and history as well as mouth watering delights served to us every day and night. The highlight would have to be the divine crab feast along with freshly caught Spanish Mackerel! Our 6 nights on this tropical paradise was full of good times! The bungalows were perfect and spacious, with the ocean lapping gently underneath the deck to add that extra touch. There was never a dull moment with so many activities to do. From the surfing and paddle boarding to the jungle walks, kayaking, fishing and more impressively the snorkelling. There is always plenty on offer, as well as the option to completely zone out and relax. The best way we could describe the Solomon Islands and especially Papatura is that it is so ALIVE. The marine life is incredible and right at your doorstep. We have never seen so much variety and colour when snorkelling. It was so refreshing and exciting to see. You could sit and watch the water all day and there would be something happening. Thanks so much to Nick and Christine for organising our trip, we were lucky enough to spend some time with them over the holidays. "Thank you . Yes we had a fun time. Quite a bit of it we had to ourselves pretty much. Surfing was good if not exceptional - I wasn’t aware that the tide pretty much prohibits anything but close to high and for us that eliminated everything except an afternoon surf, but it was a beautiful thing to bob around a break just Sam and I as the sun went down. The crew did indeed look after us very well and the food was exceptional - the location is simply stunning. Will process the photos and get back to you should I find any decent ones. " I just wanted to convey a quick message thanking you for organising a seamless and fantastic trip to Papatura. The organisation of the trip was simple and faultless. Papatura was just the tonic - an idyllic, remote and fun surfing location immersed in the Solomon culture. The hospitality and service at the retreat was fantastic and I thoroughly enjoyed the conversations with Marg, Pete, the Papatura crew and other guests. Thanks also to you for your friendliness and expertise in getting us to the best waves and guiding an ageing surfer like me as to where the best spot in the line ups were. Thanks again and I hope to return. Well, another trip to Papatura done and dusted. Such a wonderful experience as usual. This has been my 4th trip and it was as special as my first. This place is a god send. Marg and Pete were amazing as usual. I am lucky to include them as friends. And that brings me to their newest addition Mitch. Surfing guide/fisherman guide/barman. An extraordinary young man who fills the job with ease. He is such an important addition to the place. He goes along way to making the experience special just by himself. Do not let him go. The food as usual was incredible. Michael is a star, that much is clear. I read previous posts about the shortfall in food. To be fair, they are either being completely disingenuous or their heart is filled with useless malice. I paddled 6 to 10 km’s a day, followed by 1 to 2, 3 hour surfing sessions a day and still managed to put on weight. Michael is a maestro. Bravo to him. This trip was marked by the addition of some marvelous guests I got to know as well. This is part of the charm. Papatura is absolutely awesome. Pete, Marg and the crew made sure we had a great time and really looked after us. The chefs we awesome and everything we ate I thoroughly enjoyed. . They will only get better and really want to please your guests. I’m not sure why those clowns bag the food on trip advisor. Maybe their used to 5 star silver service? We had from meat pies and salad rolls to crayfish and everything was great. We loved the food and your local girls were great in the kitchen. Marg is a great cook too! I can’t believe Pete isn’t 150kg!!! I’ve never stayed anywhere where your fish are cleaned for you and you clothes are washed, and folded (!). Our fishing guides, Rowe and Jonahs (sp?) were awesome. They really know the water and were keen to make sure we caught fish. I reckon we taught them a thing or two about lure casting and sport fishing in general. Rowe was amazed when I got the fly fishing gear out he was talking about it for ages. I also had a few lures he’d never seen in action before and he was amazed at how many we brought with us. We had a ball and still caught some great fish you cannot get here in Geelong!!! I had a bit of bad luck too. I had 3 GTs short take a fly in 3 casts which is unusual and 3 or 4 good GTs follow poppers without taking them. At least two trout smash poppers without hooking up and one or two tuna completely miss the fly early in the trip. So, if I had’ve hooked all that followed, it may have been an extra 10 fish! The fish busting up on the surface were unbelievably scared of boats. Kind of like schools of tuna on the sunshine coast at xmas – as if they were chased all over the place by 50 boats. Maybe the whole off the bite thing but we couldn’t get near them for a shot with fly or spin gear. They’re a little shy and we needed to extract info out of them at times but this will only improve. I told Rowe that he is the expert and that if they get guests saying, “I want to fish in the river this morning” but the tide is wrong, he needs to say so. Something like “I think we should fish it in the afternoon because the tide is wrong.” I think that he is so polite, he just wants to please you and do whatever you want to do. I re-enforced that he is the expert and that helping people like this will ensure they get the best fishing opportunities possible. That big mackerel was the fish of the trip and certainly a massive buzz. I likened it to standing on the edge of a highway and throwing your lure on the back of a car travelling at 100km/h – it peel line against a 10/12kg drag with ease and lifted me from the seat – totally awesome. When we got it in the boat, Rowe said something like, “Ooh, I am a very happy man!” while looking down at the fish. I think there is a bit of healthy competition between Rowe and Jonahs ? and for him to have the big mack landed in his boat was almost as exciting for him as it was for me! Certainly one of my best fish! I’d love to return but it does take a bit out of the old piggy bank. I spoke to the guides and they reckon that the best fishing can be when the tides are really moving. When we were there, there wasn’t much difference between high and low tide and low tidal flow as a result. I have a few other scenery pics I can send on once I get them all sorted. He is invigorated and recharged with a renewed spring in his step. Before the trip is was looking forward to it and since his return has expressed his immense gratitude. I met Nick and Christine at the airport and instantly I knew Steve would be warmly welcomed. I have a sneaking suspicion he enjoyed the fishing more than the surfing. Thanks so much for helping us when we cut short our stay at Maravagi recently. Your offer of transport to and accommodation in Honiara and the use of Atkin’s taxi was extremely generous and much appreciated. Rachel your speedy reaction to our phone call was amazing, we really felt very uncomfortable after all that had taken place there. Yes, Uepi was just a fantastic place to finish off our holiday and as you said the snorkelling was just beautiful and swimming with the sharks just fantastic (to a point) lol! Nick please pass on our fond wishes to Marg and Pete and tell them that we can’t wait to come back to Papatura, which was certainly the pick of our 3 months in the Solomons. We are yet to arrive back home to Ceduna but when we do we will certainly forward any pics that we feel you may be interested in. All material © 2001 - 2018 Go Tours Travel.